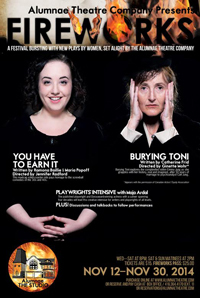 Mooney on Theatre is giving away two pairs of tickets to a performance of Burying Toni at Alumnae Theatre (70 Berkeley Street) as part of their Fireworks Festival on Wednesday, November 19 at 8 pm. To be entered into the draw for one of the two pairs of tickets just send an email to contests@mooneyontheatre.com with the subject line “Burying Toni” by 11:00 pm on Monday, November 17, 2014. Burying Toni explores the complexities within Emma Jung as she grapples with her history, real and imagined, after 50 years of marriage to psychoanalyst Carl Jung. Emma conjures up her husband, Sigmund Freud, and others as she struggles to understand the truth about her past. Performance dates vary, see website for details, performances times are at 8 pm with 2 pm matinees. Tickets are $15 with a PWYC at the door matinee on Sunday, November 16. Fireworks Festival pass is $25 and is redeemable for one performance to both Fireworks shows. Tickets can be purchased online or at the door.